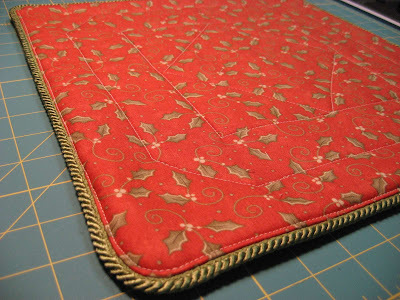 Hooked on Needles: Candle Mat Swap - HELP! Candle Mat Swap - HELP! 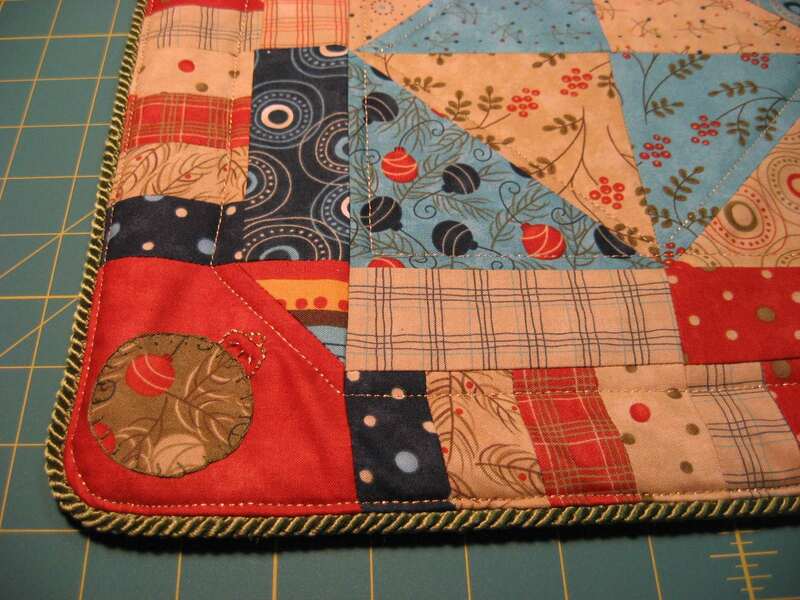 So I joined this Candle Mat swap hosted by Quilting Gallery using a design by the wonderfully talented, super creative, ever so kind and generous Sandi Anderson of A Legacy of Stitches. As it turned out, Sandi and I both used the same charm pack to make our mats. It's Adoring by Sandy Gervais who, as I may have mentioned once or a hundred times before, is my very favorite fabric designer of all time. Is it good enough to send as a swap gift? 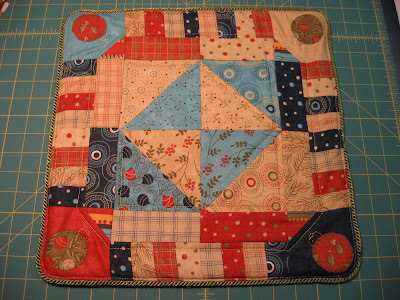 The swap rules state "Your finished piece must be quilted, bound securely and labeled on the back." I will label it, but my concern is the "bound securely" part. Does this edge finishing method count as being "bound securely"? 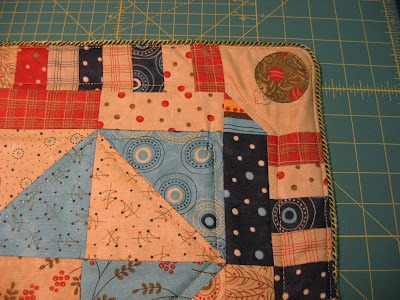 There is some bunchiness in the fabric as a result of machine quilting after finishing the edges. Would you consider that poor workmanship and be dissatisfied with receiving this mat in a swap because of it? Any advice on how this could be avoided would be appreciated. Do you think the cording on the edge makes it look too much like a deflated pillow? Give it to me straight! Would you want to receive this as a swap gift? If not, please tell me why. I can take it! I'm seriously considering making a different one to send, but I need to know if I'm being overly critical, or if my concerns are valid. Thank you for any insight you can provide! 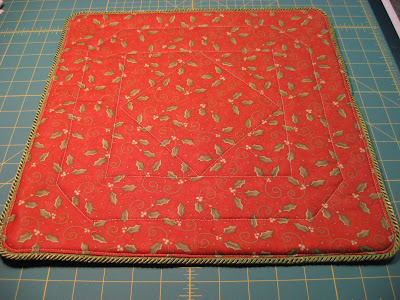 Okay, Mary Grace, we have known each other almost two years thanks to blogging and I am here to tell you right now that your mat is perfect to send off to a swap partner. The way you bound it is just fine, in fact, I love the cording and do not think it looks like a "deflated pillow". The detail on your ornaments is better than mine. But.........if you are not satisfied with it, then you should make another one. I would be happy with receiving this mat so I think it's good to be concerned but you might be overly critical of your work. Note that all of this is just my humble opinion. :-) I love anything that someone takes the time to stitch. I love your binding. I think the bunchiness may be a problem. I love it! I think it makes an excellent swap gift. First of all, I really like the way you embellished the ornaments, and I like the binding. 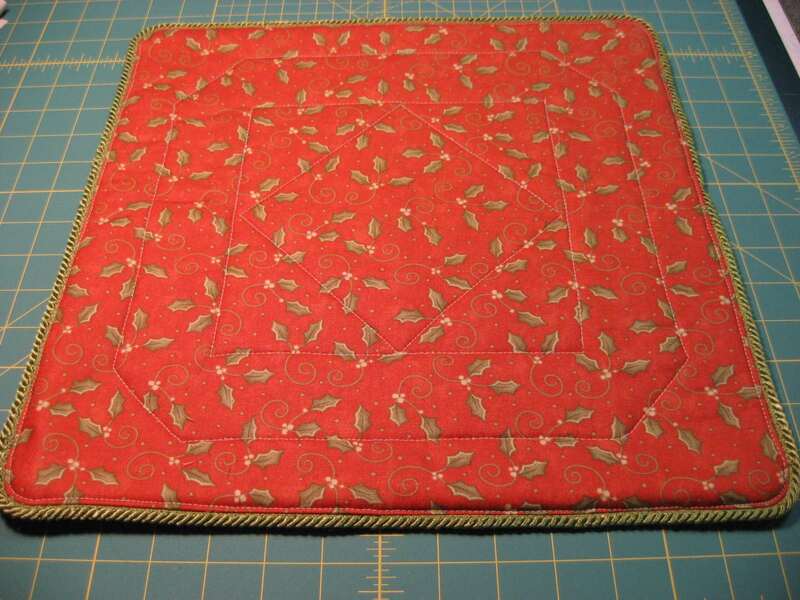 It is different and makes it look more like a furnishing than a quilt. It probably also makes it a bit heavier, which is good for a mat. It looks "bound securely" to me! And your piecing is excellent! 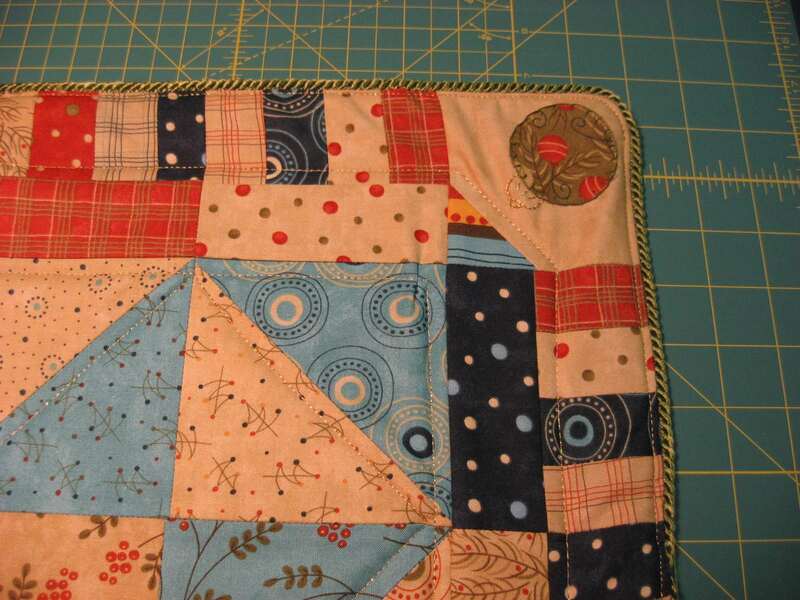 Do you starch heavily before piecing? Buuuut, I don't like the bunchiness, and the stripes along the edges seem to slant, probably in the direction the cording was stitched on. 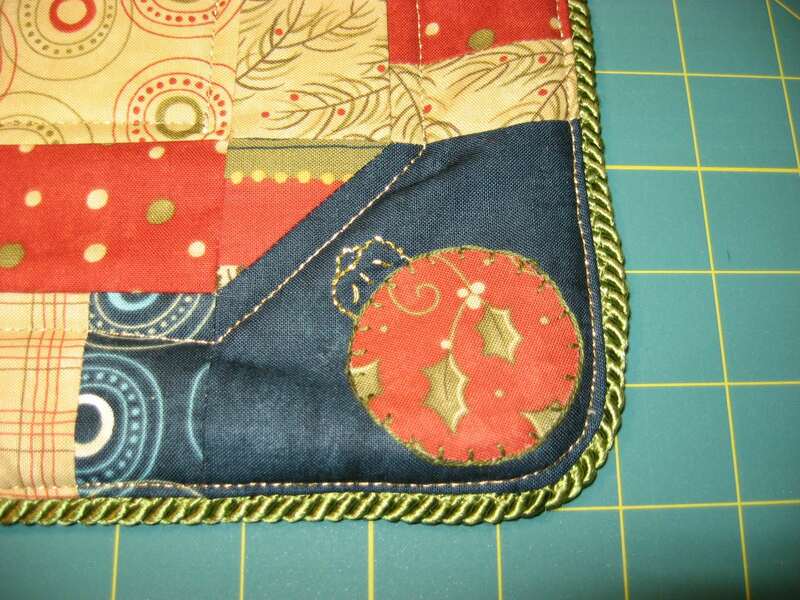 Without being able to look at it more closely, I would probably take out the cording, stitch in the ditch down the stripes, maybe add a bit of stipple around the ornaments to make them stand out and reduce the bunchiness, then re-add the cording. 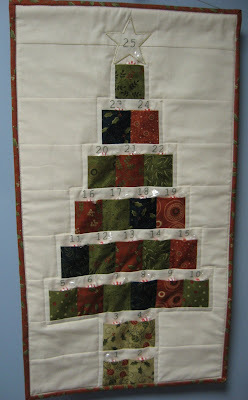 Or you could hand quilt around the ornaments, then add a quilted tiny ornament or two alongside them. 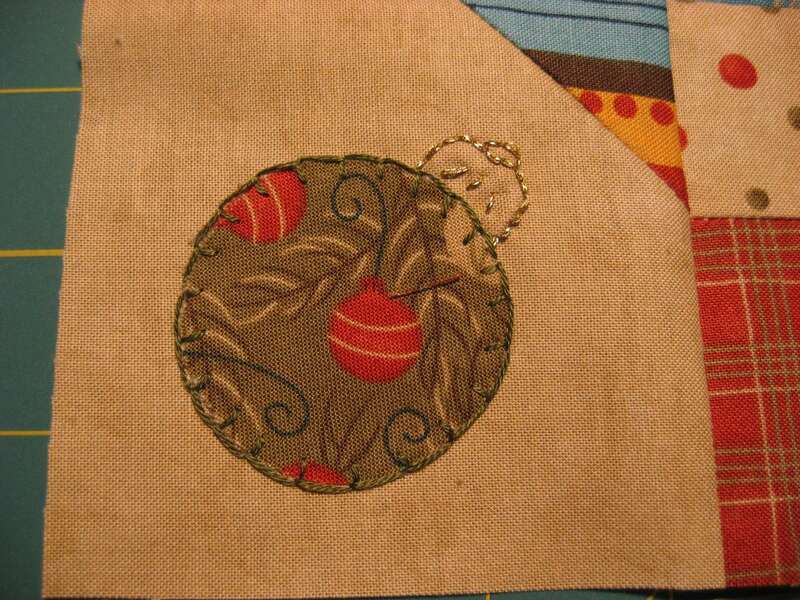 I would also stitch in the ditch in the center block, or quilt the ornament motif I mentioned earlier. 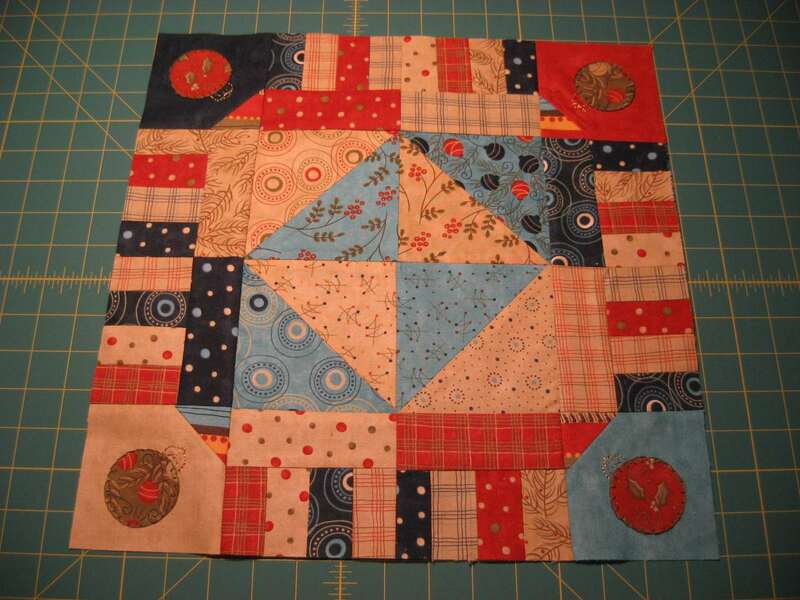 (can you tell I'm a heavy quilting fan?) This should fix it without having to redo the whole quilt. Then I'd be pleased to receive it! You are SOOO talented with the needle! I love the color palette you selected. 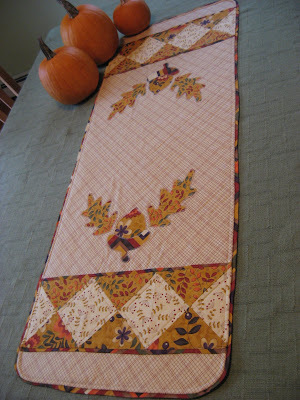 I am not a quilter but in my eyes this mat is perfect - I would be thrilled to receive it. 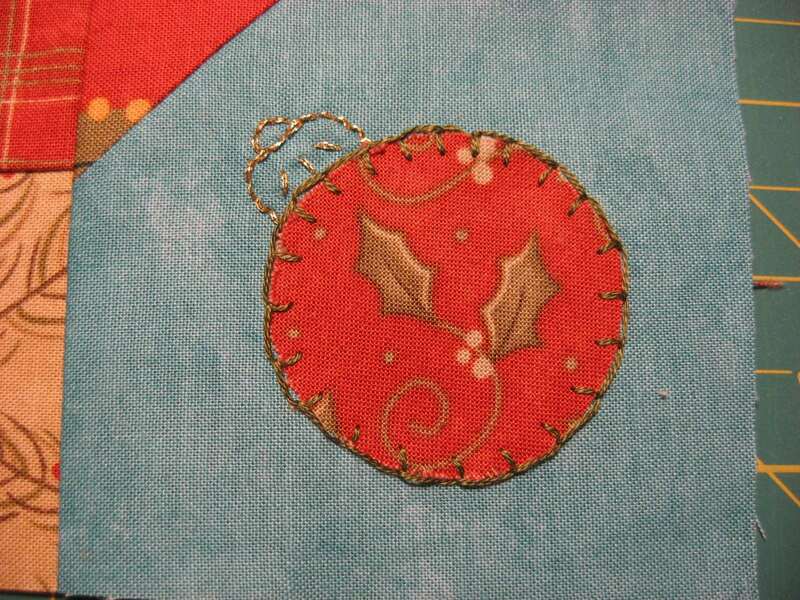 The fabric is beautiful - love the ornament embellishment. Ok - I'm not going to be much help b/c I think it looks great ... but - I will say this - go with your gut. If you are uncomfortable with it then see if you can tweek it. Good luck! I would love to be the recipient of this candle mat. I think it is very lovely, and did not see any bunchiness. That would not bother me at all. Love your design, and you probably know I'm a fan of unusual binding techniques. Question, though. Do you use a walking foot? That might help keep the edges from shifting. But I will add, I didn't notice the issue at first. I had to go back after the comments, and really look for it. And like the others said, you really have to go with your own feelings on something like this. My two cents for what it is worth. I love it!! Anyone who takes that much time and puts that much effort is an A+ in my book. But it seems to me if you are aksing that many questions you are not happy. I would be with a swap such as yours but you have to be happy to give it. I'm a little late on my comment, but I just wanted to tell you that I know exactly how you feel and what you are going through to be sure your mat is perfect. It's lovely as is, but I agree with what several other commenters have said, in that you should fix whatever has you so concerned. You won't feel good about it until you do. 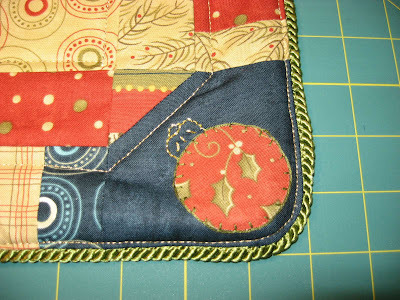 I love the edging and especially love the needle work you did on the ornaments. 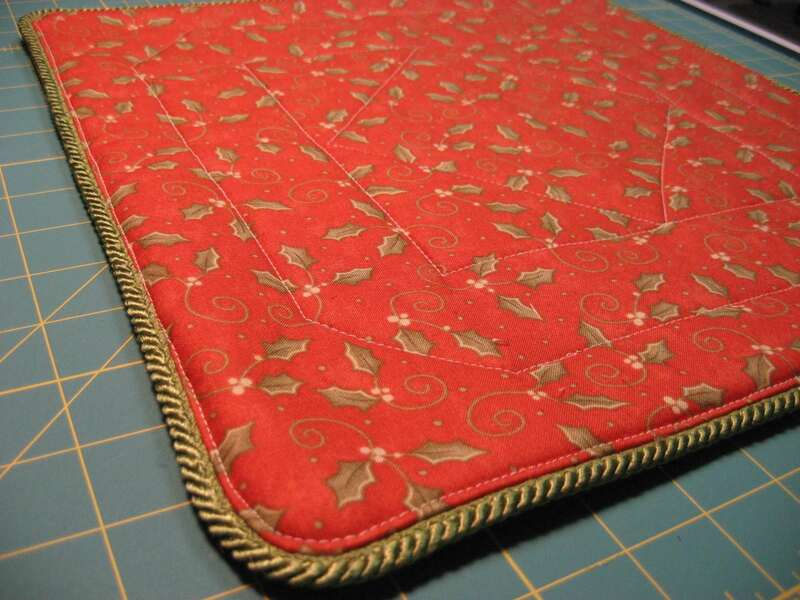 And, of course, the fabric is great. If the bunchiness would make a candle tip over, than fix it. You did a beautiful job.